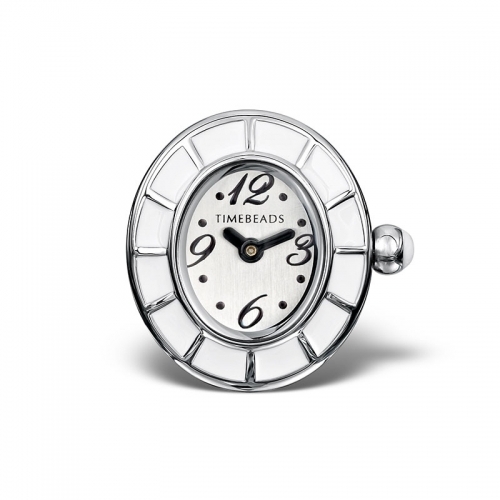 This Timebead features an oval face with a white dial set inside a stainless steel case with an enamel crown and bezel. It is powered by a quartz Seiko VX00 movement and attaches onto your bracelet with a screw mechanism. Dimension: 2.5cm x 2.5cm Timebeads are compatible with Pandora, Spinning and Storywheels bracelets and necklaces. CONDITION: EX-DISPLAY. Items may include slight tarnishing, discolouration, scratches or chips. Please note that the image is for illustration purpose only and does not represent the defect. Please note, this item DOES NOT come with Timebeads packaging as standard.